Remember last year when I made the light mint green top/brown linen pants combo? Remember how I matched the cover art for the Butterick 6183? Well, I did it again. 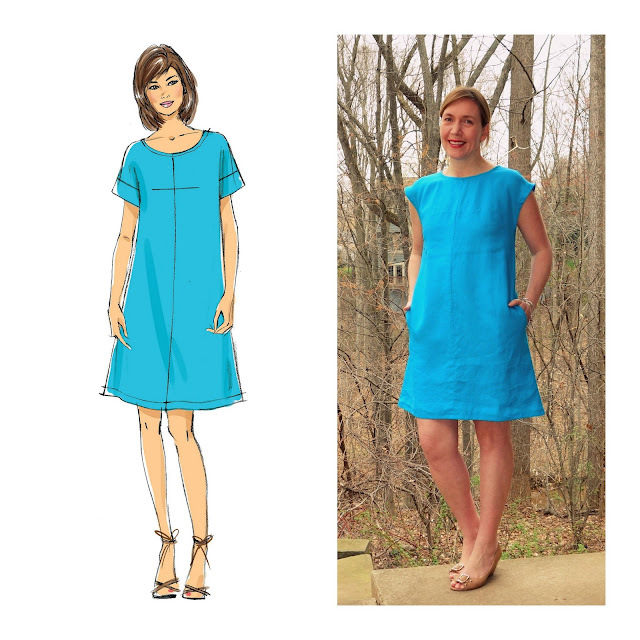 I guess I really must aspire to be the cover art for Lisette, as this is the second (accidental) time I have made a garment that pretty much exactly looks like the cover of a Lisette for Butterick pattern. LOL. Clearly there is a difference or two from the original and my version, but they do look darn close. All in all this was a satisfying make, and since making it over a month ago, I have worn it three times, so it is a satisfying wear, as well. When faced with my make for the month of April, I knew two things, I wanted to make it in a bright solid color and I wanted a project that I could get done before leaving for Spain in late March so I could wear it on my trip. The colors I had chosen for my travel wardrobe were teal/aqua blue, black, and grey (you can see many of my outfits here), so when I heard that the Designer Linen had come in, I thought this would be a perfect fabric to make something with, and when I spied the ocean blue color, I knew I had found the perfect solid shade to match my wardrobe. A couple of notes on this fabric. 2. I washed this garment twice before I was happy with its hand. I love a very stiff, polished linen, but it wasn't working with this dress shape. It made the sleeve stick up a bit (especially when paired with my square shaped shoulders), so I wanted to soften the dress as much as possible. Linen is very amenable to softening, but if you want a polished look, definitely make the garment before laundering, and then only dry clean from there on out. Every time it's been washed, by the way, it looks better to me. 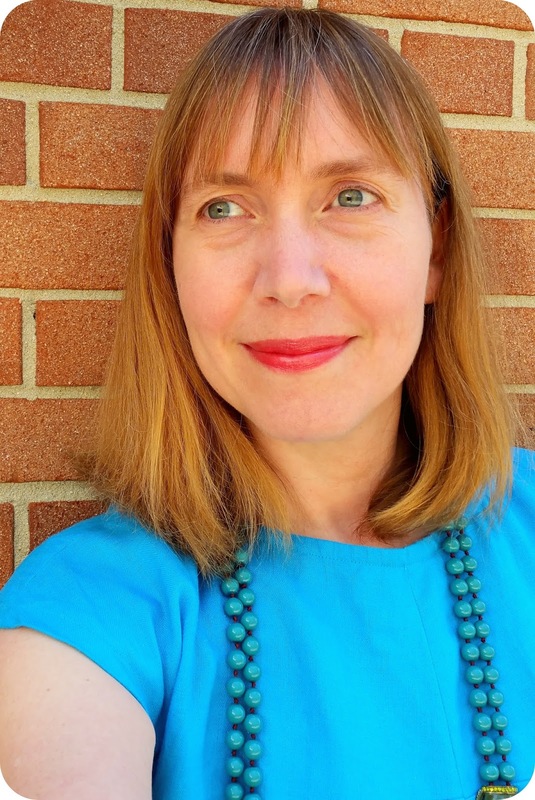 I hope to wear it so much this summer that it is exactly the softness and worn in look that I look for in my favorite summer linen garments. 3. It frays terribly. 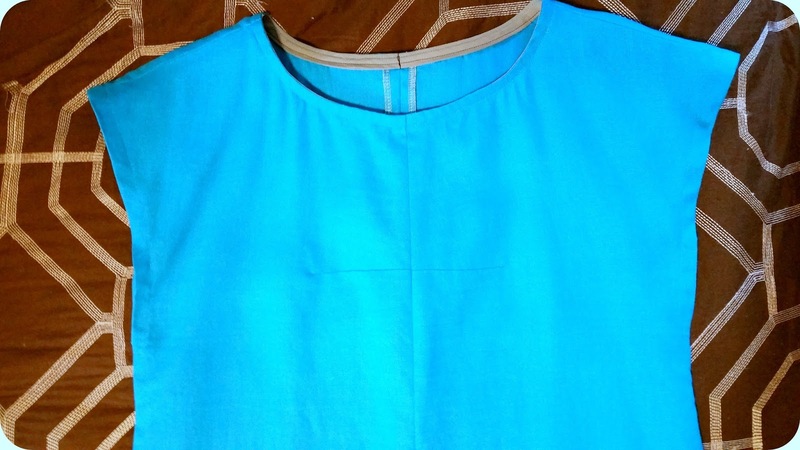 Definitely finish the seams, be it with the serger (as I have done), binding, or turning and stitching. I don't think pinked seams would be enough, though, so if that's your favorite, it will likely not be enough to counteract how much fraying happens with this linen. 4. The color is luscious. So so beautiful. It really does have the look of the Caribbean Sea in Cancun, Mexico. All the colors seems really pretty from this designer linen grouping, but this ocean blue seems the brightest and most eye-catching. I own a lot of accessories, clothing, and shoes that work well with this color, so it's no wonder I have worn it as much as I have. :-) It is an exact match for one of my favorite J. Crew necklaces! In this photo you can see that my legs can be "seen" beneath the fabric. This only happened in front of this window at our hotel in Spain. Clearly, the bright light coming in is causing the effect. The dress is being worn with tights here. 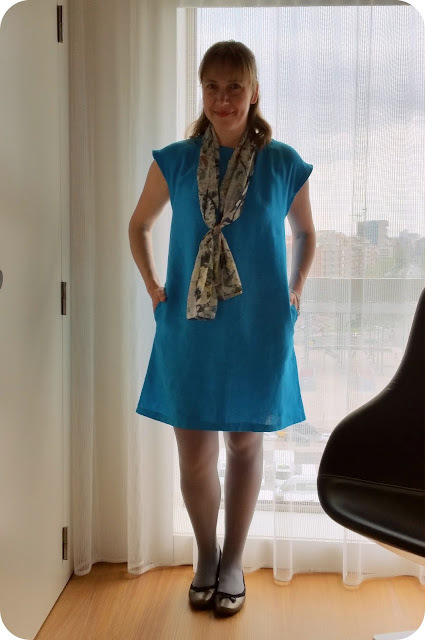 I didn't find the linen stuck to the tights, so I was really pleased when I discovered that, as one of the reasons I planned to line it was so I could wear it with tights. The Butterick 6182 pattern is wonderful, and I have many great things to say, but I do want to point out three items of note for those of you planning to make this pattern up. 1. This dress/top runs very large. I cut a size 8, and it fit great out of the package in an 8. 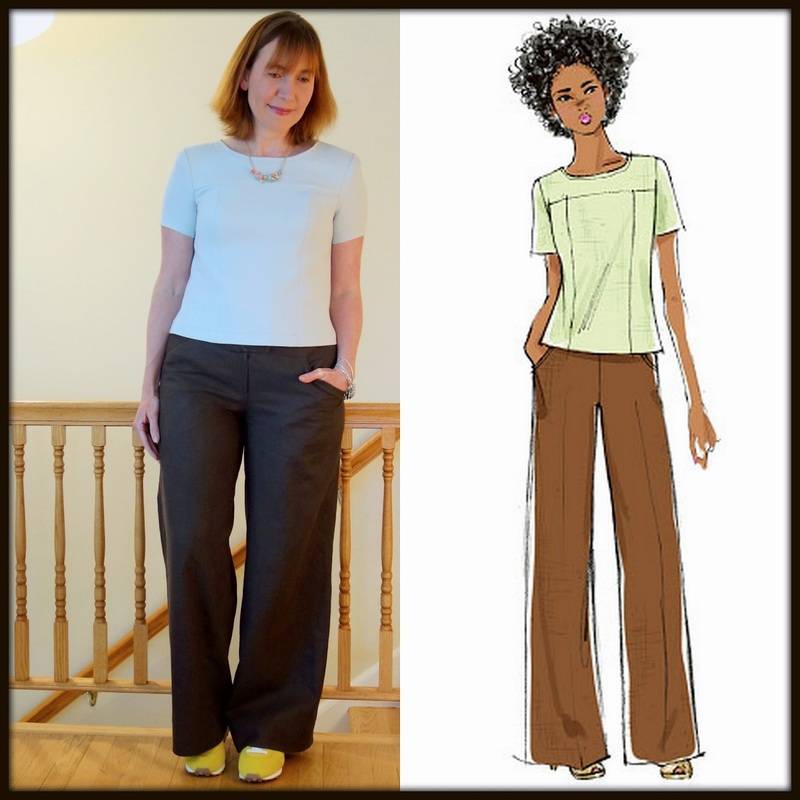 Butterick tops seem to fit big on me, as I wear a 10 in almost all the other patterns. 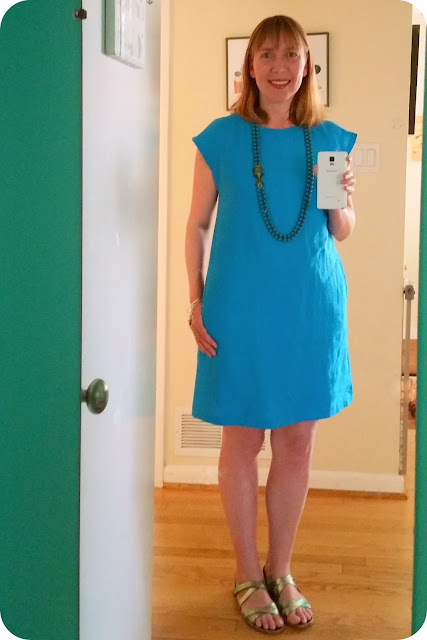 The dress should not fit me on the bottom half, though, in an 8, and I didn't cut an 8, but I did grade out to the 10. I *should* wear a 14 (on a good day! ), and maybe even a 16. 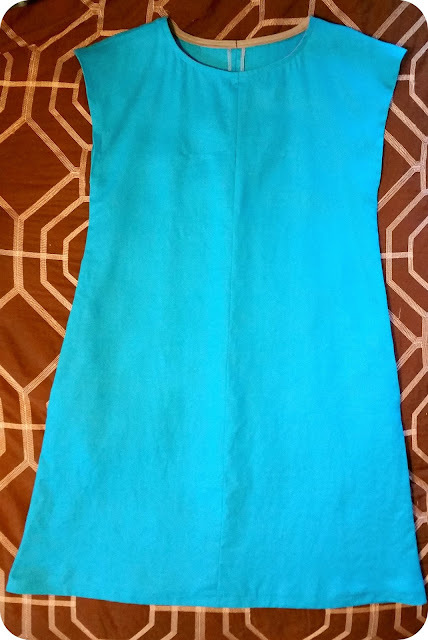 This dress is cut to be wide and loose, but had I cut a 10/12/14 (bust/waist/hips), it would have been way way too loose, and ended up looking too sack-like. 2. I need to make a square shoulder adjustment or at least figure out how to get rid of the tips of the shoulders where they go up. It just looks funky. It is lessening as the garment gets softer, but I don't love it. I am not a huge fan of how the sleeves look as drafted, so I left them off in favor of this more "cut-on/sleeveless" version instead. Still don't love it, though. I tried to make the length longer, but could stand to have an additional two inches. It is the perfect length for casual days in summer, but I am unlikely to wear this, as is, to teach in. I might wear it with tights in the winter, but that is all. The school's dress code is very conservative. The dress has no pockets, as drafted, but as per usual for me, I added side seam pockets from another BMV pattern (all of their pockets seem to work well with other patterns!). Clearly this view shows a more fair weather styling, with sandals and no topper/tights. I wore this to hang out with a friend in Old Town Alexandria on a recent Sunday, very warm, sunny, and perfect for a linen dress. Here I am in the "transitional season" styling, with a coat, tights, ballet flats, and a scarf. I did end up taking off the coat at one point that day, but because we were thousands of feet up on the side of a cliff (ugh, my fear of heights was challenged that day! *), the winds would kick up and cool me off again. * The second photo in the collage shows me with my arms in the air. 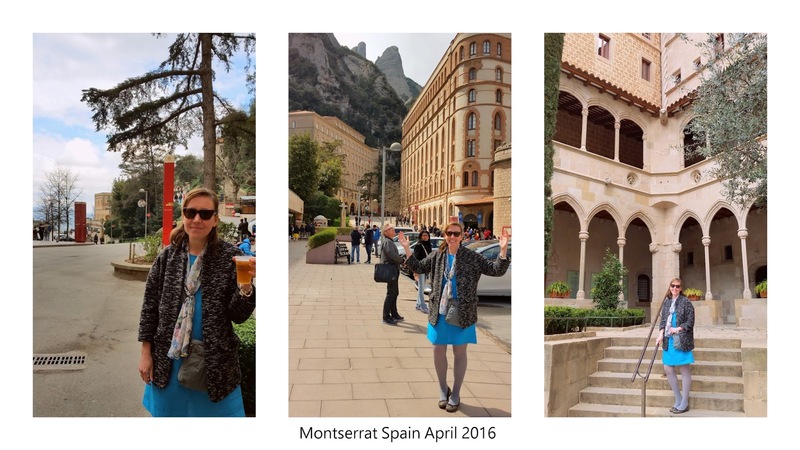 Those are jubilant arms, exclaiming that we didn't plummet to our death in the very scary cable car they use to get us up to the monastery there at Montserrat. The lady behind me is smiling because she knows how freaked out I was as she sat there staring at my baby-ish self unable to look at anything but the floor in the cable car. The first photo, there with the beer, was my attempt to get some liquid courage before taking the *bright yellow death by cable car* back down the side of the cliff. Okay, that's it for now. I really hope that you all give this dress pattern and some designer linen a go. They really are a very lovely match. And a very easy piece of clothing to wear and wear and wear again! I love it! I've been eyeing this dress. It looks like one of those easy-to-wear pieces. And the color is just beautiful on you. That's a great color on you- really beautiful with your eyes! And I like the simplicity of the style. I bet Spain was gorgeous this time of year. Awesome dress! You look terrific! Love the versatility of this piece. Would look great on any age and figure type! Dina, this is beautiful and I love this linen! I will have to purchase some of it! This is a super cute option for linen and I love this color! Psssss.... and you do match the pattern cover.